A new Black Dragon, who's appeared on two FILL shows. Leo & Impossible are feuding. 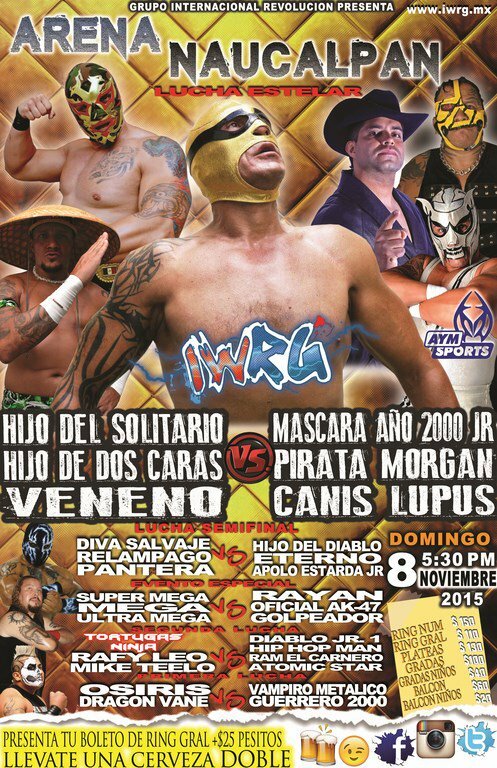 Hijo de Dos Caras won the title back in the title rematch, with plenty of interference from Veneno and Canis Lupus. 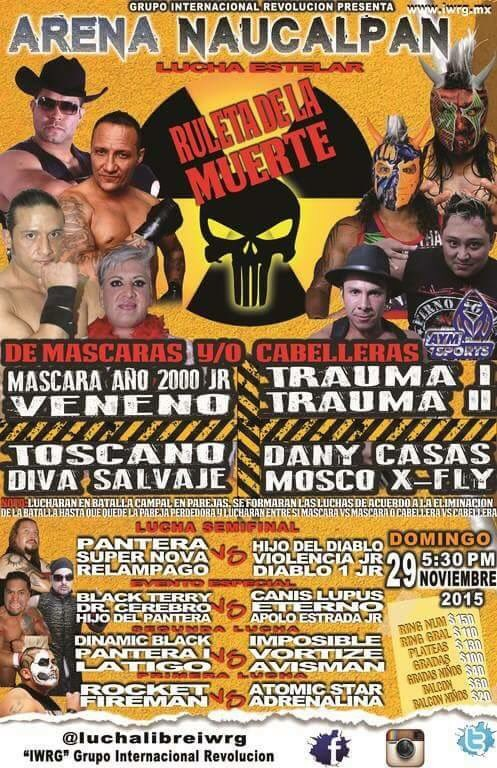 Mascara has 0 defenses. Hijo de Dos is the 22nd champion, this is his 2nd reign. 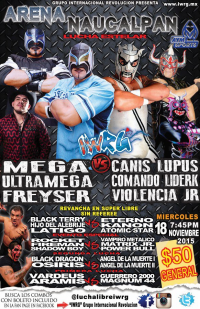 Astro Rey Jr. is (for at least the moment) going by the name Astro due to issues with Mephisto over the Astro Rey Jr. name. Everyone was required to stay in the cage for 10 minutes. 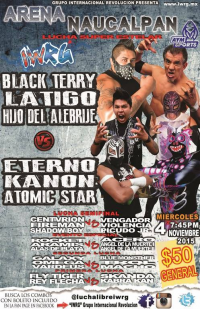 First four our were Hijo del Pantera, Canis Lupus, Trauma II and Astro. Last three left were Rafy, Golden Magic, and Golpeador. They did the tease of Golpeador leaving those two to battle it out, but they brought him back in. Rafy escaped, then Golpeador and Golden Magic climbed down the same side of the cage at the same time. They stopped on the apron and started hitting each other, with Golpeador (accidentally) falling off the cage while trying to to hit Golden Magic. GOlpeoador pulled Magic with him, but it was obvious to all that Golpeador hit the floor first and Golden Magic should be the loser. Instead, Golpeador was declared the loser. He attacked the referee multiple times while protesting. The crowd loudly chanted Fraude and booed Golden Magic. Golpeador eventually unmasked as Ferando Cornejo Camarena, 35 years a luchador, who'd previously wrestled as Tarasco III in this arena. Rocket (or Rocker) is from the US. Terry fouled Eterno and faked a foul to draw a DQ. Eterno wanted another super libre. An Osiris previously appeared in 2009, this is probably a new one. This is a new Leo. Spector & Fresero replaced Oficial AK47 & Rayan. 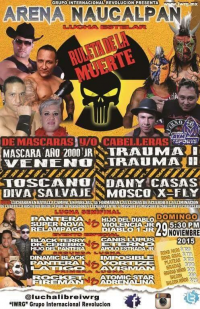 Mascara gave Veneno a martinete for a DQ. 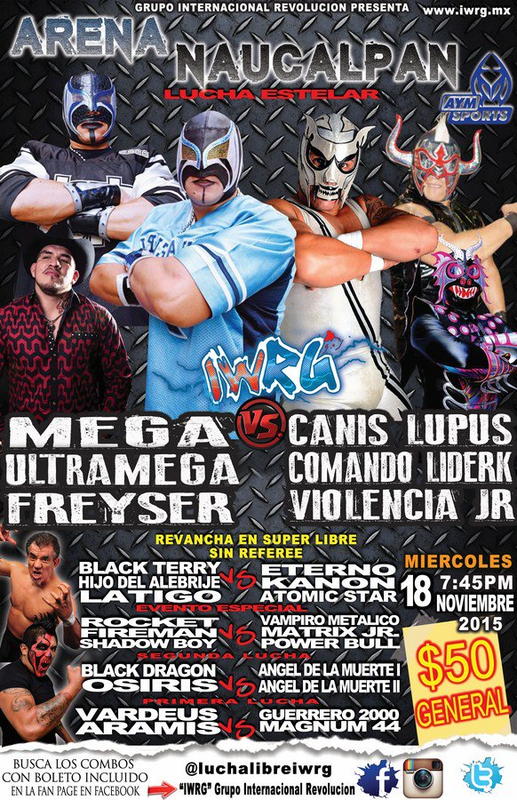 Rafael el Maya was referee on this show. Centvrion's first match here since last Christmas. 3) Leo, Mike, Rafy, Teelo b Diablo Jr. I, Golpeador, Imposible, Violencia Jr.
Eterno snuck in a foul on Pantera I.
Karoaui made it from wrestling in Arena Mexico earlier the day. Tecnicos took 2/3. 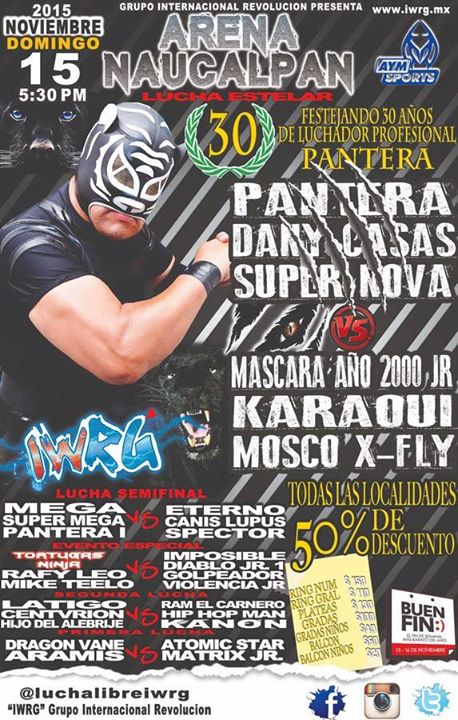 Mascara challenged Pantera to a mask vs hair match. Rematch from last week. Team Eterno took falls 2/3. the last when Kanon sneaking a foul on Alebrije. Eterno challenged Terry to an apuesta match. Dinamic Black's return after being gone for a couple years. 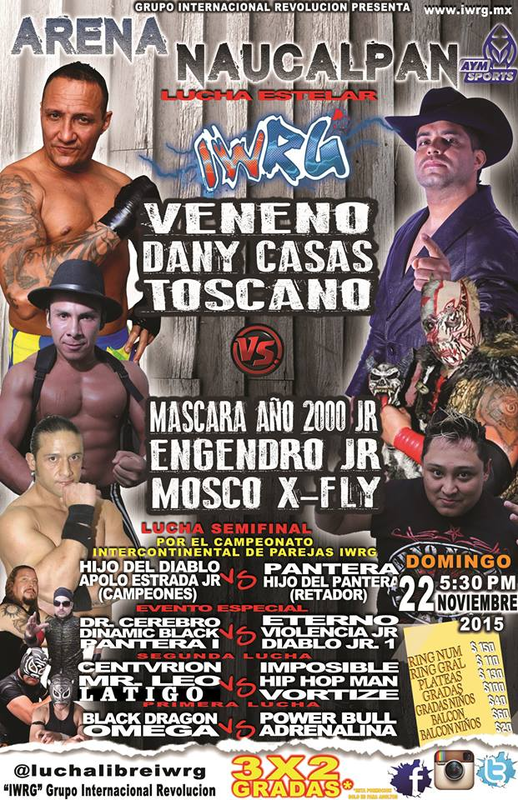 Rudos cheated to a win. Terry & Eterno bled. Straight falls. 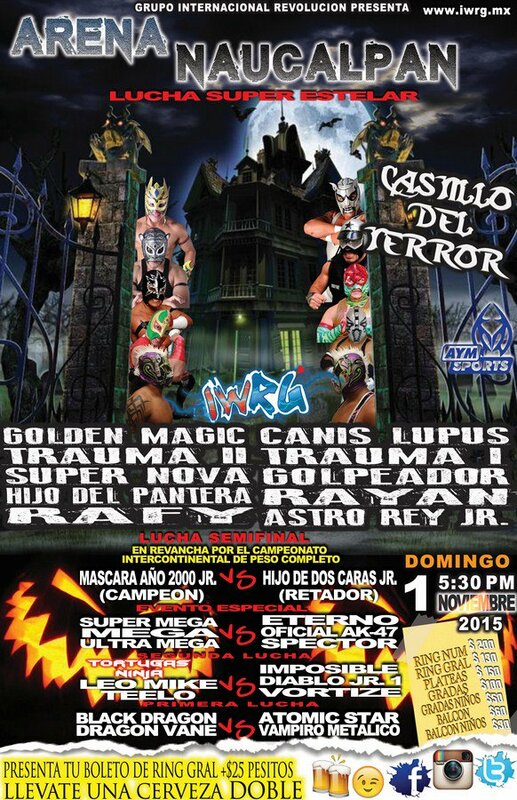 Rudos want a shot at the Mexican State trios championship, Black Terry challenged back for an apuesta match. straight falls. Super Nova & Relampago had problems. Despite the win, Veneno & Mascara did not get along. 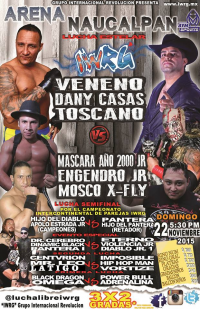 X-Fly was already bleeding bad after the last match and couldn't really help out Danny Casas, so Toscano & Diva won easily. X-Fly was still in bad shape, still almost won. But only almost. X-Fly got his head shaved and talked about possibly retiring after another case of bad luck.